A WONDERFUL fusion of sacred text, narration and music thrilled the congregation at Carlow cathedral recently for the parish’s annual carol service. The event showcased the extraordinary talent in Carlow parish in a spiritual and meaningful way, featuring a host of choirs, soloists and musicians under the direction of Marian Gaynor and the Carlow cathedral parish team. “It was a beautiful service which celebrated the traditional Advent themes of hope, peace, joy and love through the symbolic lighting of the five candles of Advent,” explained Marian. “The carol service was very close to Christmas this year, so we did wonder whether it was too close, but actually we had an even better attendance than normal,” she said. “It really has become a tradition for people every Christmas. For so many, the carol service signifies the arrival of Christmas,” said Marian, adding that 2018 also marked the 25th year of the religious service. The cathedral’s three choirs – Amadeus, Cór an Aifrinn and the Cathedral Parish Choir – presented a beautiful repertoire of sacred music and much-loved Christmas carols, while guest groups included Aspiro under the direction of Mary Amond O’Brien, Scoil Muire gan Smál school choir and Anam Cairde. 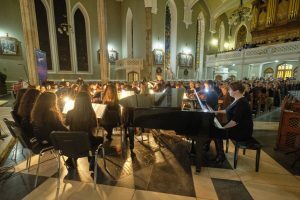 Soloists included Kathleen McDermott, Suzanne Byrne, Julianne Woods and Frank O’Donnell, while Carlow Youth Orchestra, under the direction of Majella Swan, also enhanced the spiritual atmosphere. The large congregation in the cathedral was also encouraged to join in during a number of traditional Christmas carols.